The Chalet series comes as a High-Tech Single-Sided and See-Through model. This model can also be made to accommodate Masonry. The fireplace can be made with single or double doors. Construction of the doors consist of high temperature ceramic glass, with a lifetime warranty, gasketed to a rugged 22 pound door frame. The door latching system is double-pinned (top and bottom) for a long term tight seal. 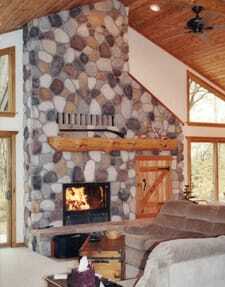 The Chalet Fireplace offers a 35” x 19” viewing area! It has up to 180,000 BTUs/hour, a burn time of up to 12 hours and has the capacity to heat up to 4,000 square feet! A 465 CFM Blower with variable speed control can be installed with this unit to provide additional control over the speed of the heated airflow. The blower is mounted on fiberboard and placed at the bottom of the chamber underneath the system. The blower should be positioned so the air flow is directed to the back of the chamber wall.